Technology｜SURROUND- Deliver in a certain sound creation "Kaori of sound". Acorn shaped rear cabinet suppresses internal standing wave, and thus reproduces more natural sound. With its non flat; both in-and-out curved surface suppresses unwanted vibration and reproduce the slightest harmonic overtone. Resonance, which is the most significant factor of sound deterioration of canal type headphones, at around 6 kHz generated by occluded ear canal is suppressed. 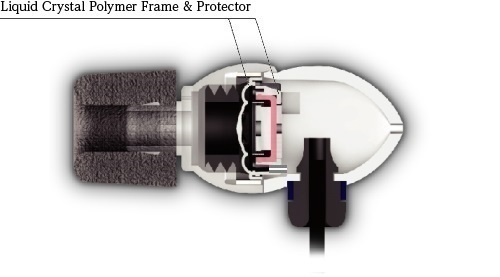 Principle of the tornado equalizer. "Ocharaku Web site"
Even the smallest incidental sound produced by vibration is controlled by adopting liquid crystal polymer for frame and protector. Controls the equivalent mass in the vibrating system depending on frequency, and thus, due to lower resonance frequency (f0), enhancement in deep bass range and sensitivity improvement in midrange are compatible. Ocharaku's patented acoustic technology, Tornado Equalizer Circuit, is employed. Additionally, applying the acoustic turbo circuit to the transducer variably controls the equivalent mass in the vibrating system depending on frequency, and thus, due to lower resonance frequency (f0), enhancement in deep bass range and sensitivity improvement in midrange are compatible. Taking advantage of single transducer, Donguri-RAKU smoothly reproduces from ultra-low to ultra-high tone ranges.